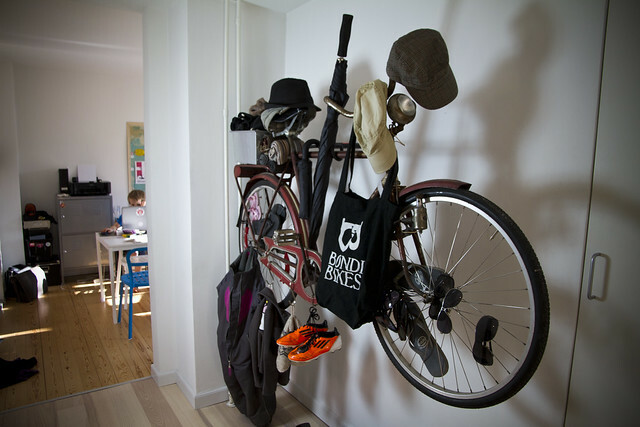 The internet is alive with photos of people hanging bicycles in their homes. As storage in many cases, but also as interior design. It's obvious. Bicycles possess an eternal and powerful aestheticism and symbolism that often makes them as appealing to look at as artwork. Here at home, I've had a 1947 Husqvarna bicycle lying around the flat. Standing in the living room and looking lovely. It just wasn't enough, however. 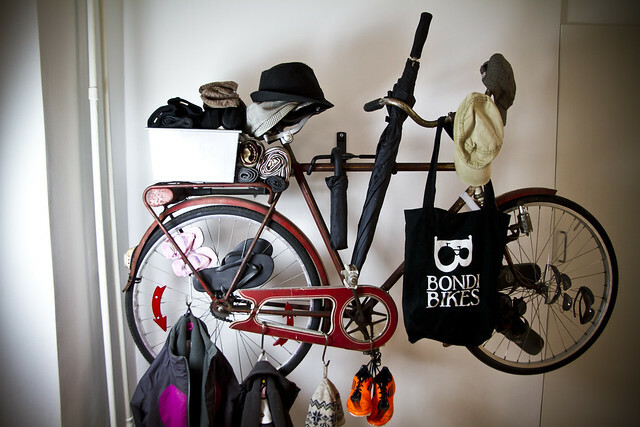 The bicycle is a practical tool for making my everyday life easier by helping me get around the city. So why not, I thought, do the same indoors? So up it went, that lovely old Husqvarna. Into the front hall where I needed something more interesting than shelves anyway. It's the first thing you see when you come into the flat and, most importantly, you can store stuff on it. Me and the kids "decorated" it once it was up - much like we did when we decorated it last christmas. 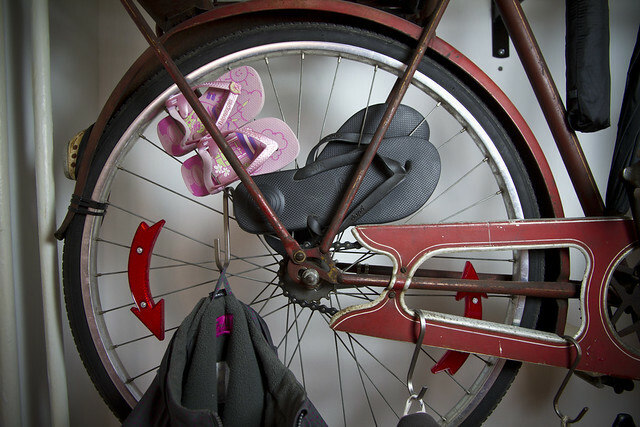 Who would have realised that flip-flops would fit so perfectly in the spokes? Cool. 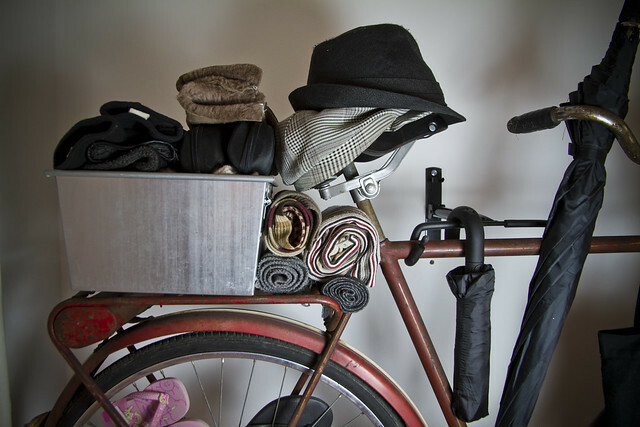 The big winter jackets hang elsewhere, so the bicycle remains rather uncluttered. Been using it for a few days now, and it's all very practical - as well as aesthetic. In that order. Great idea, I found an old Vindec in our shed and I was thinking it would look great mounted on the outside wall of the shed. Don't think my wife will agree to it being in the house though! Very nice and practical indeed! I have 2 'dicarded' bicycles (one a 'gift' and the other picked from the neighbourhood) as garden decorations after giving them an anti-rust coating and a spray of paint. The next such bicycle may find a place indoors. Thanks for sharing. 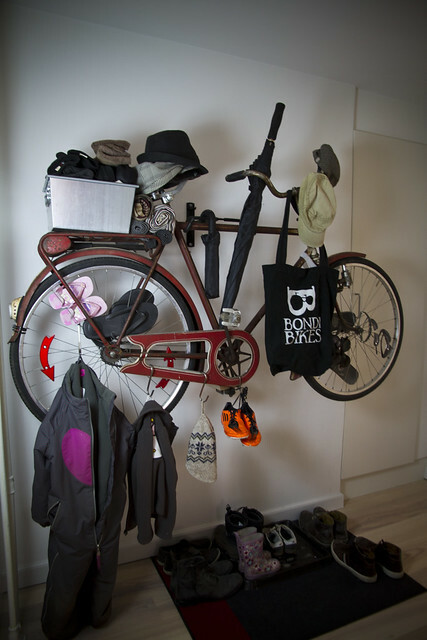 I would be perfectly happy if my boyfriend wanted to hang a bicycle up inside, I love seeing pictures of bicycles on peoples walls. Hey, could you let me know where you got the actual bike hanger from? That black thing! looking for one like this since ages! I just found the rack on eBay by searching for wall bike rack. there were a number to choose from.